Hytec supplied CarboAir™ Filter Kits come supplied with a CarboAir™ Filter, extractor fan (options), 5 mtr of combi ducting and the 3 clips need to assemble the kit in the size you require. CarboAir™ 50 filter kits with TT fan All CarboAir filter kits are supplied with 5 metre of Combi-ducting, 3 quick clips of the size kit you require. 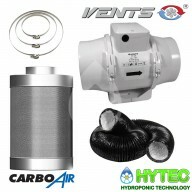 CarboAir™ 50 has been developed to filter VOCs (Volatile Organic Compounds) from smaller grow room environments.CarboAir™ 50 has a 50mm bed of vi..
CarboAir™ 50 filter kits with RVK fan All our CarboAir filter kits are supplied with 5 metre of Combi-ducting, 3 quick clips of the size kit you require. 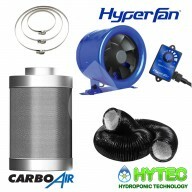 CarboAir™ 50 has been developed to filter VOCs (Volatile Organic Compounds) from smaller grow room environments.CarboAir™ 50 has a 50mm bed ..
CarboAir™ 60 filter kits with RVK fan All our CarboAir filter kits are supplied with 5 metre of Combi-ducting, 3 quick clips of the size of kit you require. 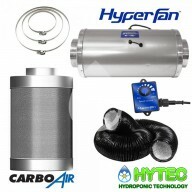 CarboAir™ 60 has been developed to filter VOCs (Volatile Organic Compounds) from smaller grow room environments.CarboAir™ 60 has a deep 6..
CarboAir™ filter kits with Phresh HYPER fan. All our CarboAir filter kits are supplied with 5 metre of Combi-ducting, 3 quick clips of the size kit you require & a pair of rope ratchets!! 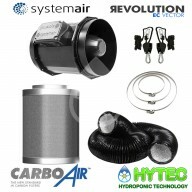 CarboAir™ 50 has been developed to filter VOCs (Volatile Organic Compounds) from smaller grow roo..
CarboAir™ FILTER KITS WITH SYTEMAIR REVOLUTION STRATOS FAN. All our CarboAir filter kits are supplied with 5 metre of Combi-ducting, 3 quick clips of the size kit you require & a pair of rope ratchets!! CarboAir™ filters have been developed to filter VOCs (Volatile Organic Compou..
CarboAir™ filter kits with Phresh HYPER STEALTH fan. All our CarboAir filter kits are supplied with 5 metre of Combi-ducting, 3 quick clips of the size kit you require & a pair of rope ratchets!! 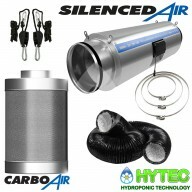 CarboAir™ 50 has been developed to filter VOCs (Volatile Organic Compounds) from smaller grow ..
CarboAir™ filter kits with Revolution Silenced Fan All our CarboAir filter kits are supplied with 5 metre of Combi-ducting, 3 quick clips of the size kit you require. 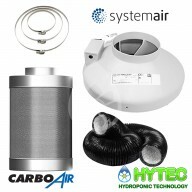 CarboAir™ filters have been developed to filter VOCs (Volatile Organic Compounds) from all sizes of grow room en..
CarboAir™ FILTER KITS WITH SYTEMAIR REVOLUTION VECTOR EC FAN. All our CarboAir filter kits are supplied with 5 metre of Combi-ducting, 3 quick clips of the size kit you require & a pair of rope ratchets!! CarboAir™ filters have been developed to filter VOCs (Volatile Organic..